It's a fascination that started in the flickery, muted color of 8mm film, home movies of bullfights taken by my parents in Colombia in the late 1960s. The images were reinforced by Hemingway's “The Sun Also Rises,” the first novel that I read in its entirety and the book that taught me the beauty and joy of fiction. It led me to read Hemingway's other works on the corrida de toros, along with the writings of Michener and the Beat writers who spent time in Mexico and couldn't help but comment on the activity. 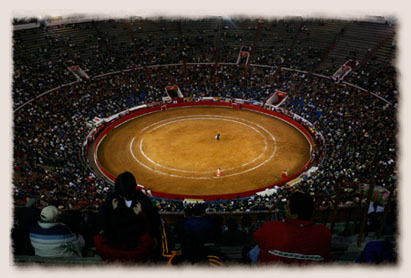 So when I found myself in Mexico City on a Sunday afternoon in November, there was no choice but to attend a bullfight. We took the metro to the Monumental Plaza México, the world's largest bullring with a seating capacity of nearly 50,000, located just south of downtown. There were to be four matadors that afternoon instead of the usual three, meaning a total of eight bulls would be killed. 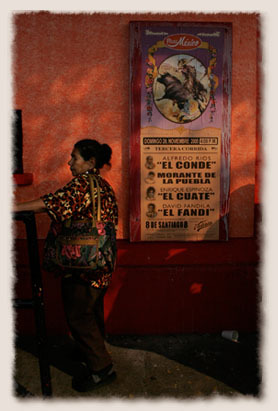 Posters advertising the Sunday evening fights were lined up along the ticket counters. Outside of the arena, vendors selling anything from seat cushions to child-sized matador outfits. 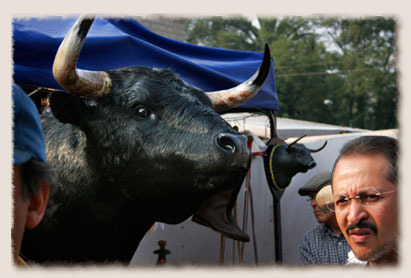 This vendor had a stuffed bull's head at his hat stand. The Monumental Plaza Mexico brought crowds of families and friends. The arena had seats in the sun (cheaper) and seats in the shade. A sign said no cameras allowed but we saw flashes going off during the fights, so I brought the camera out occasionally during the fights, taking care to keep it hidden from passing vendors selling food and drinks for fear of it possibly being confiscated. 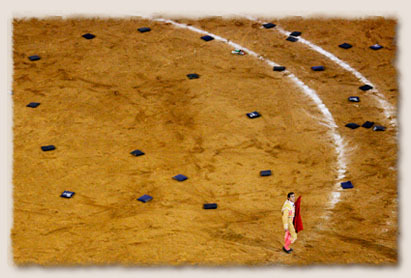 Like any event, pictures or words cannot substitute for experiencing a bullfight in person. When you're actually there you understand things, like why the matador's outfit, which sparkles in the afternoon sun, is called the “suit of lights.” We sat in the Sombra General section, the open seating on the shady side of the arena, gated and fenced off from the more expensive seats, with a rowdy crowd and the smell of puros, the big cigars sold at the gate, filling the air. We were 25 rows up, still close enough to see foam coming from the nose of the first bull to come into the ring. The animal that burst through the red doors was magnificent. Anyone who has grown-up around farm cattle cannot appreciate a fighting bull until they see one in person. A fighting bull is to a dairy cow what a wolf is to a poodle. A fighting bull's movements are more feline than bovine. They are intent, focused and aggressive animals, their tail swishing in the quick flicks of a cat about to kill a baby bird that has fallen from a nest, as they eye the matadors and contemplate a charge. In the ring they move with grace and speed, pivoting on their front legs, letting their hind end swing around in line for another charge, agile like a linebacker for their size and bulk. The fighting bull is killed in three acts. 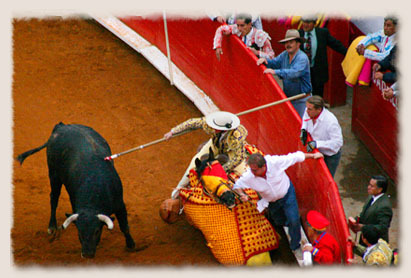 In the first, the bull is shown off in the ring, with the matador's assistants, or toreros, luring the bull with their capes and then dodging behind wood barriers when they charge. They are followed by picadors, mounted horsemen who drive a lance into the bull's shoulders. In the second act, barbed hooks on short wooden poles, called banderillas are placed in the bull's shoulders, so that his muscles will weaken and he will hold his head lower when he charges. 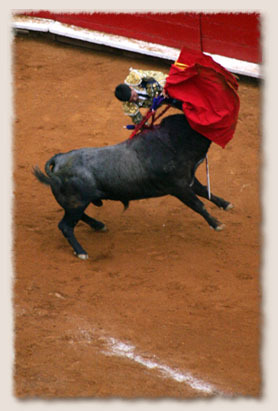 In the final act the matador uses the small red cape called a muleta to work the bull before he kills it with a sword. 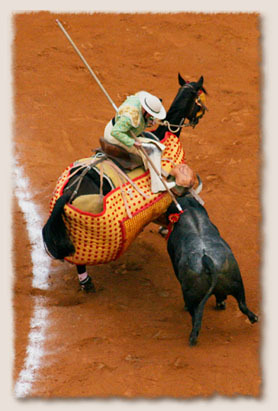 In the beginning of the fight the bull is shown off by the toreros who taunt the bull with their colorful capes. The picador stabs the bull with a lance to weaken it. 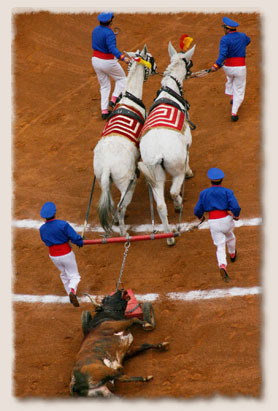 With several banderillas stuck in its shoulders, the bull heaves beside the matador, who prepares for the kill at the end of the fight. 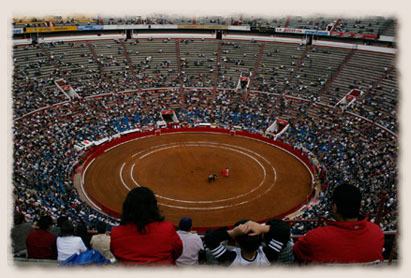 Mexico City may not be the best place for a person to see their first bullfight. The atmosphere has the feeling of a minor league and the event seems more spectacle and less art. Spain is the birth place and home of the bullfights and maybe like food, bullfighting is something you should sample only in its environment of origin. The first matador of the afternoon seemed timid, dancing away as the bull passed too close. The banderillas missed their mark, their sticks falling out. Some just gave up after several unsuccessful or aborted attempts. One bull hit a picador's horse and knocked it down. The animal, uninjured under its layers of thick padding, was stuck like a turtle on its back in the arena sand. The crowd whistled and booed, and the bull just stood there, looking passive and stupid, as the ring filled with men struggling in a Marx brothers routine to get the animal back onto its feet. The second matador murdered his bull, after six attempts, against the wall, poking at it with his sword like a shuffleboard player, as his toreros held the animal at bay with their capes. 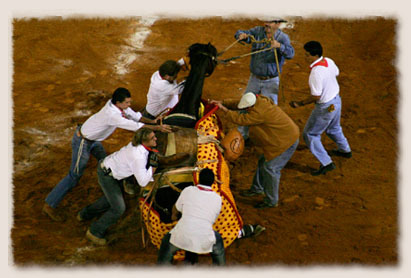 A picador stabs a bull to keep it away from his horse that was knocked off its feet after being rammed against the arena wall. A picador's horse that was knocked down took seven men to help the animal get to its feet. The horse wears protective padding that keeps it from being gored by the bull. Before going to my first bullfight, I had the impression that a skilled matador would kill his opponent almost instantly, expertly placing his sword between the charging bull's shoulder blades and severing its spine. Either my impression was wrong or there were no skilled matadors in the ring that afternoon, because none of the bulls were given a quick death. 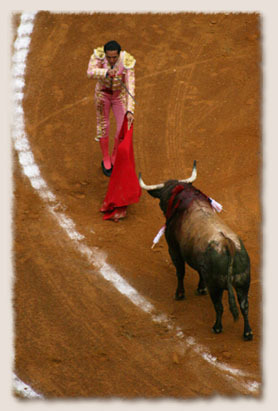 The matador lines up his sword with the bull's shoulders for a kill that is not instant. It's been said a million times before and no one would argue that bullfighting is a sport. But it is not a sport in the same sense that boxing or rock climbing are not sports. Bullfighting is not a game without consequences. Hemingway called bullfighting a tragedy. The only tragedy that I saw on that Sunday afternoon was the tragedy of a bull that wasn't killed quickly. It was dying slowly that transformed and took the beauty from a fighting bull. 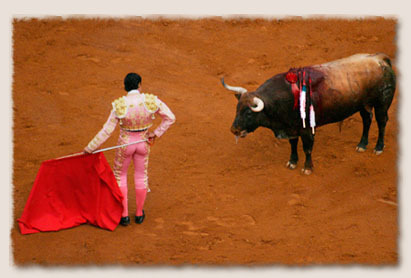 As the matadors botched their attempts with the sword, a weakened and confused fighting bull became a cow, standing static in the ring, their chest heaving in the short, shallow ecstasies that both animals and humans use when they are in pain, the fear of knowing they were about to die quivering through their body. Given the chance, the dying fighting bulls would turn and run away. Most were ran in circles by the cape-wielding toreros, until they would collapse and lay there to have their throat slit like a steer in the assembly line of a meat packing plant. The animal dies, legs splayed out and kicking, everything taken away from it except the dignity of a stray dog hit by a car. The act of dying rarely holds dignity for any living thing. Death takes beauty and vitality and turns it into something absurd and grotesque, the stumbling stupidity of a deer that has been struck by a high powered rifle bullet or the head shaking and squealing of a farm hog that has been shot between the eyes so that it can be butchered. I had only ever seen one thing die with dignity and that was a groundhog that I shot in a trap when I was ten years old. It stayed crouched in an aggressive position, teeth bared, blood coming out of its nose, losing nothing to death except the light that seeped from its eyes slowly as it died. But none of the bulls that I saw in the Plaza ring on Sunday afternoon died like that. When the fight was over, the arena took on a circus like atmosphere, with tinny trumpet music accompanying red and blue suited men who came out with rakes, wheelbarrows and chalk to prepare the ring for the next fight. The bull's carcass, just a hulky mass of flesh devote of either grace or beauty, was dragged away by a team of white mules. A team of white mules drags away the first bull killed in the fight. The ring is then prepped for the next matador. It wasn't until Enrique Espinoza, the third bullfighter, entered the ring, that I began to understand the art that a bullfight could hold. Espinoza worked the animals so close that the blood from the charging bull's shoulder brushed off on his suit. Twice he was tossed, the bull catching the matador in his horns and sending him tumbling. Both times he got up and went right back to work, no change evident in his work. The crowd loved him for it. Enrique Espinoza gets tossed by his first bull. Espinoza's performance was only topped by the final matador, David Fandila. Fandila placed his own banderillas, an act he did so skillfully that the other banderillas looked like amateurs. His passes with the cape drew the crowd's cheers of “Ole,” as he turned the animal almost on its nose, Fandila's body arching to avoid the horns that passed just under his outstretched chest. By the time Fandila had finished his final bull the crowd was on its feet, waving handkerchiefs and throwing their hats and seat cushions into the ring. 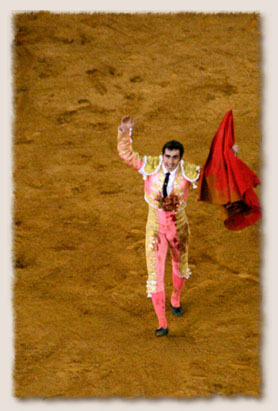 David "El Fandi" Fandila, covered in his bull's blood, raises his arms to accept the crowd's cheers and seat cushions that are tossed into the arena. "El Fandi" walks off the seat-cushion littered arena after making his rounds to the cheering crowd. But neither Espinoza nor Fandila killed their bulls quickly, their animals dying slowly and passively against the wooden barrier. I left the arena, still retaining a groundhog as my only model of courage. The Monumental Plaza Mexico in Mexico City is lit up Sunday night during the end of the corrida de toros.